Living in a closely connected global community grants us the opportunity to try many different foods from many different cultures. A lot of these foods come directly from the ocean. Among these treasures of the sea is an animal that you may have never heard of—the sea cucumber (not to be confused with the vegetable). Found dwelling on the ocean floor, sea cucumbers are sausage-shaped animals that get their name from the vegetable they so closely resemble. It may not look like a tasty dish, but what if we told you that it has extreme health benefits, and could even help fight cancer? Just know that looks can be deceiving; it’s what’s inside that counts.The sea cucumber has been around since the ancient times. The Chinese were the first to recover it and have been using it in their diet ever since. The Atlantic sea cucumber was collected mainly as a food source throughout history, but has recently been researched as having uses for medical purposes. If you happen to be near an ocean with access to these creatures, you can prepare them at home. 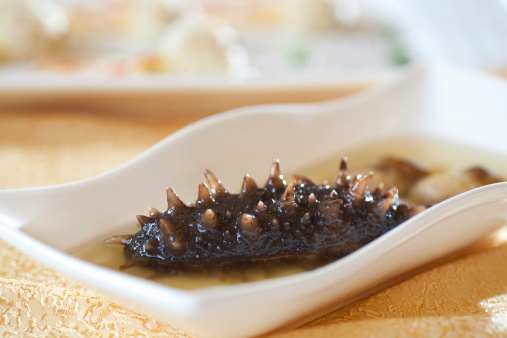 Preparing the sea cucumber is similar to preparing fish. After washing it thoroughly, you can boil it in salty water and then let it dry. Once it is dry and ready to prepare, you need to soften it. This process is quite lengthy, so if you’re thinking about preparing sea cucumber, make sure you give yourself at least a couple days to prepare it.To soften the sea cucumber, place it in a pot and add cold water to cover it; soak it for at least 12 hours. Then cook it on low heat for one to two hours. Always ensure water is covering the sea cucumber. If the water level is too low, the sea cucumber will begin to harden. Being readily available predominantly around the waters of East Asia, people who don’t live in these regions do not usually have direct access to all the beneficial components that fresh sea cucumber has to offer. The good news is that extracts of its materials have been put into capsules and tablets that are available for everyone around the world to try.Natural sea cucumber supplements either come on their own or as ingredients that are combined with several other healthy nutrients. Sea cucumber is often included in supplement formulas used to promote joint health. What if we told you that sea cucumber can prevent the growth and spread of cancer cells? Ethan Evans, author of The Eden Prescription, has done previous research on the sea cucumber and came to the conclusion that it has the ability to kill lung, breast, prostate, skin, colon, and liver cancer cells. A study showed that when given to mice with non-small cell lung cancer, a compound known as frondoside A, which is found in oils and plants, was responsible for shrinking the tumors by 40% in just 10 days. Compare this to chemotherapy, which shrinks tumors by 47% and has significant risks and side effects, whereas there have been no reported risks or side effects of ingesting sea cucumber. One main component that is found in sea cucumbers is chondroitin sulfate, which is known for its ability to reduce arthritis pain. In addition, the sea cucumber contains two anti-inflammatory fractions. One of the fractions has fatty acids, the same as you would find in fish. These fractions can substitute fish oil supplements in reducing inflammatory byproducts of the fat metabolism and can also support the brain and heart. Finally, sea cucumbers have a healthy nutritional profile that can benefit your diet, as they’re high in protein and very low in fat. The moral here? Don’t judge a book by its cover. Despite the unfavorable appearance of the sea cucumber, its potential health benefits are extremely rare, especially coming from a natural source. Sea Cucumber: How This Marine Animal Could Help You Fight Cancer? Dharmananda, S., “Sea Cucumber: Food and Medicine,” Institute for Traditional Medicine web site; http://www.itmonline.org/arts/seacucumber.htm, last accessed April 24, 2015. “Sea Cucumber,” American Cancer Society web site; http://www.cancer.org/treatment/treatmentsandsideeffects/complementaryandalternativemedicine/pharmacologicalandbiologicaltreatment/sea-cucumber, last accessed April 24, 2015. Ell, C., “The Benefits of Sea Cucumber,” Livestrong.com, January 28, 2015; http://www.livestrong.com/article/263233-the-benefits-of-sea-cucumber/. Howard, R., “The Benefits of Sea Cucumber,” SFGate web site; http://healthyeating.sfgate.com/benefits-sea-cucumber-5710.html, last accessed April 24, 2015. Renter, E., “Sea Cucumber Found To Kill 95% Of Cancer Cells, Shrink Tumors,” Natural Society web site, November 5, 2013; http://naturalsociety.com/sea-cucumber-shrinks-cancer-cells-95-percent/.